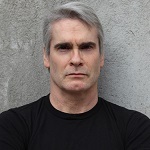 “Rollins is many things,” says the Washington Post, “diatribist, confessor, provocateur, humorist, even motivational speaker…his is an enthusiastic and engaging chatter.” Entertainment Weekly’s list includes “Punk Rock icon. Spoken word poet. Actor. Author. DJ. Is there anything this guy can’t do?” TV Guide has more concisely called him a “Renaissance Man” but if Henry Rollins could be reduced to a single word, that word would undoubtedly be a workaholic.” When he’s not traveling, Rollins prefers a to keep a relentless schedule full of work, with gigs as an actor, author, DJ, voice-over artist and TV show host to name a few of the roles that keep his schedule full.